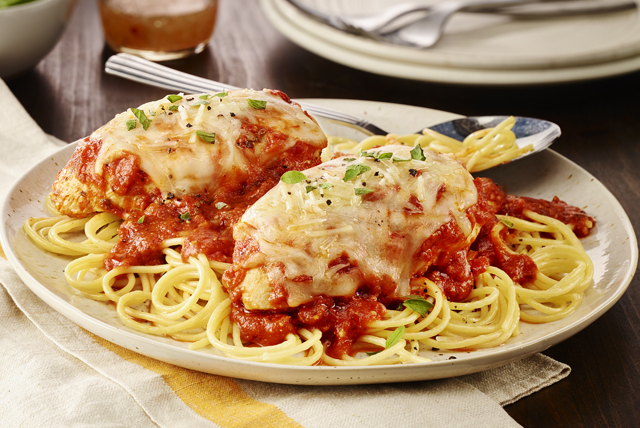 Our Spicy Tomato-Chicken Parmesan adds a fun new twist to a classic recipe, raising it to the next level. Why wait? Try this soon-to-be new favourite tonight! Pour pasta sauce into 13x9-inch baking dish sprayed with cooking spray. Stir in 1/4 cup (4 Tbsp.) Parmesan. Add chicken; turn to evenly coat both sides of each breast with sauce. Cover. Top chicken with mozzarella and remaining Parmesan; bake, uncovered, 5 min. or until mozzarella is melted.